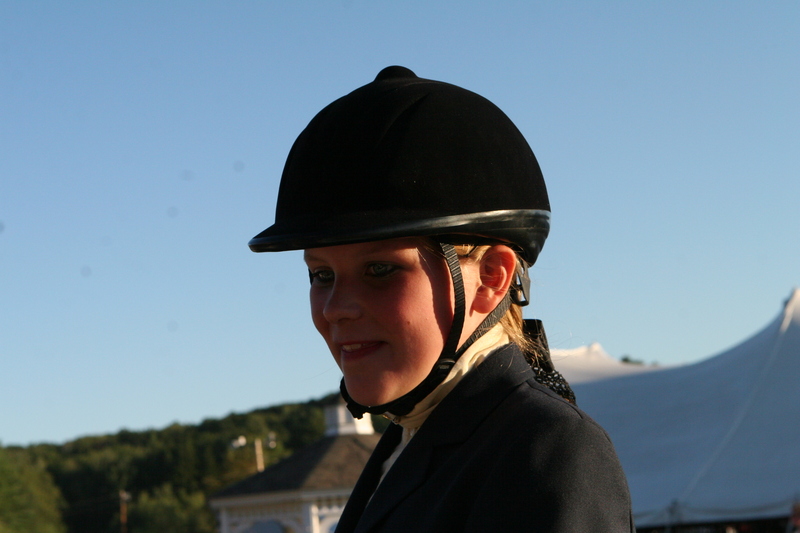 Ellinore and I spent the weekend at the Cheshire Fair Horse Show. The one hundred and forty-nine classes ran from Friday to Sunday afternoon. We travelled to the event with Debbie Hardy, our little pony friend Anna, Debbie’s horse Fawnledge Shazam, and Reme. It is clear that the agricultural roots of the fair have diminished over the past few decades. Families and farms are adapting to a changing economy and culture. There are just fewer people farming, and hence the barns at the fair are not overflowing with animals as they had been in past years. Still, around the strip of the arcade and nausea-inducing rides , the draft horse pulling went on with huge teams of animals dragging huge cement blocks across the dirt floor of the indoor arena; there were tractors on display and a lawn-tractor pulling competition; and, the 4-H club was there, too. As a 4-H alum, I was drawn into the barns to see the pigs and goats and cows. It was odd to see the 4-H club selling food that was not produced locally—an unfortunate disconnect between the diminishing farming community the club is attempting to keep alive and the real benefits of creating a local economy for small farm produced foods. 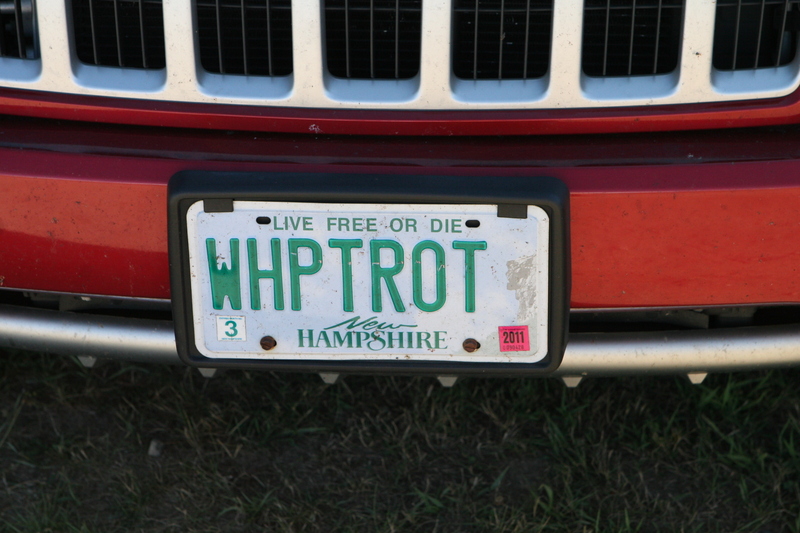 The equestrian world, however, is robust and thriving. A new riding surface in the outdoor ring is surrounded by white peaked tents under which stables from around the Northeast set up shop. The stables roll in with huge trailers with horses of every size and shape—from miniature ponies to immense black Friesians. These are serious operations; and the few hundred dollars to rent stalls appears insignificant in light of the beautiful bloodlines and shiny tack and equine paraphernalia. Our little trailer and Chevy Suburban full of pre-teen girls traveled to and from Debbie’s in Chesterfield each day. We set up the “easy up” awning, filled buckets of water and filled hay nets for the horses, and settled in for the day. 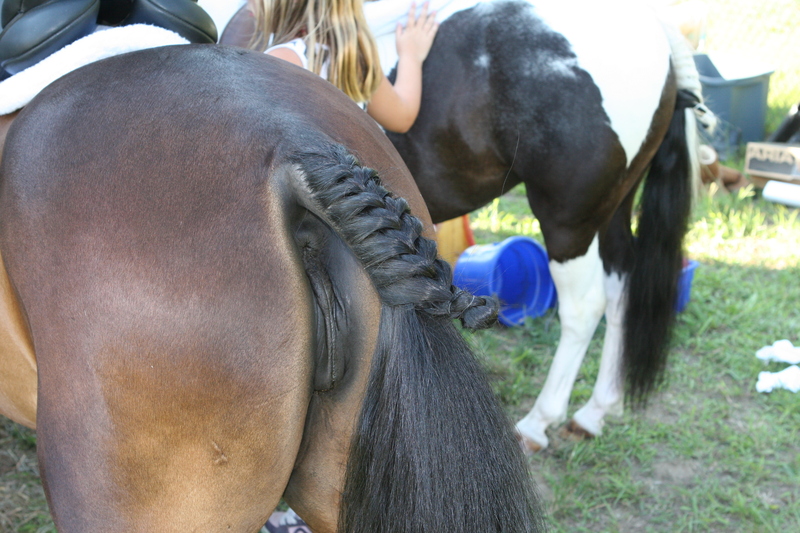 Horse shows are interesting, too. 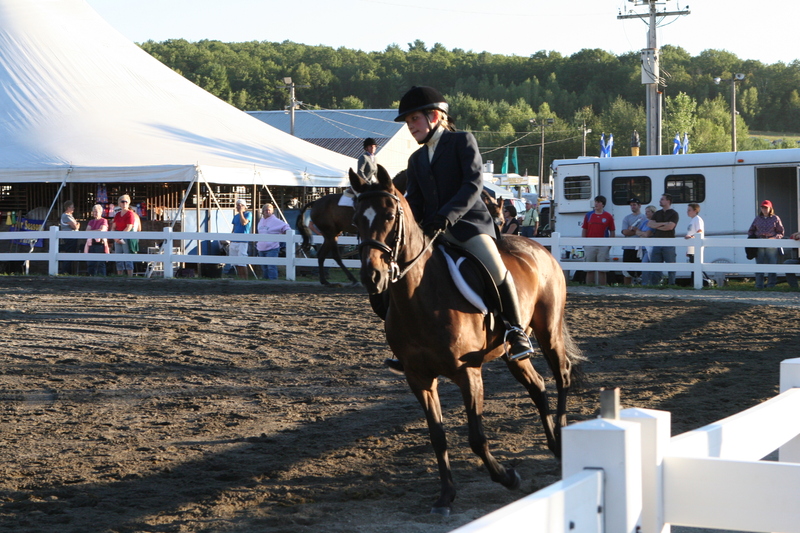 The remarkably poised and sharply-dressed girls riding English and the colorful Western shirts and stiff hats; the stable owners on the rail, with firm instructions as their riders pass at a trot or canter; the families tensely observing their daughters (there are a few sons, though) respond to the commands of the announcer under the ever-watchful eye of the judges. The judging, like any specialized activity, is astonishing. Ten to twenty horses and riders in the ring, all apparently perfect. I spend more than a few classes watching the judges watching the riders, trying to see how they are looking and what they might see. More experienced riders and instructors, like Ellinore and Debbie, are talking about posting on the diagonal (which means, I believe, that when the outside leg stretches forward—the leg against the rail—the rider posts up and then returns to the seat when the leg on the rail hits the ground. For the simple rule is that if you get the wrong lead ,just once, and the judge sees it, as she is inevitably going to do, you are out of the running in that class. There are no mulligans in the ring. It takes a great deal of time to run over a hundred classes. The announcer calls the class. 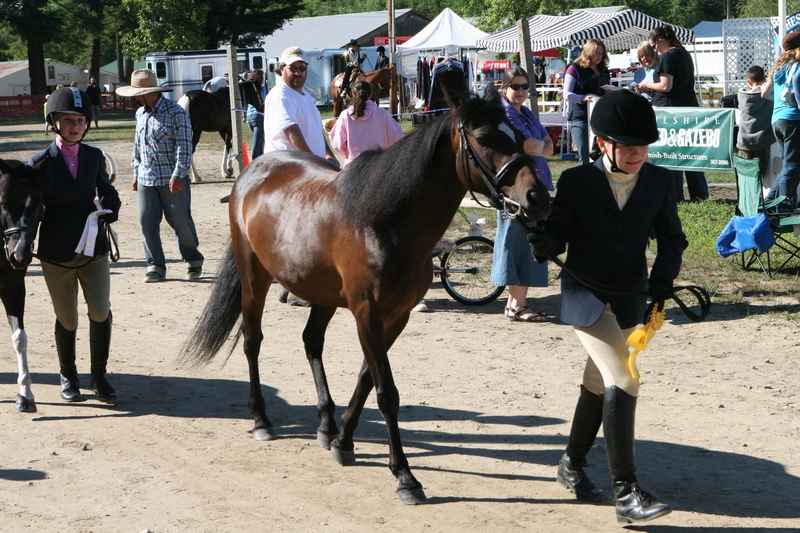 The riders walk or trot in. Then the gates are closed and the riders circle around the ring. The judge cues the assistant who radios the announcer who calls out the commands. 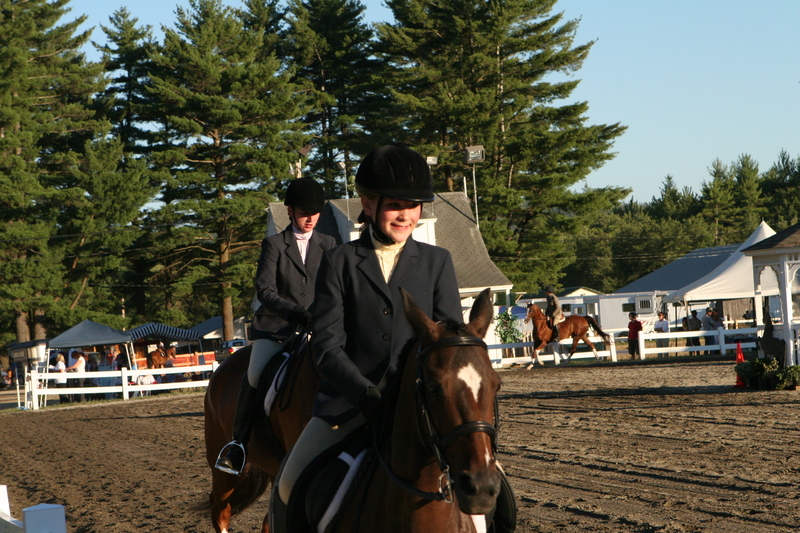 “All riders walk,” “trot,” “now extend the trot,” “canter please,” “reverse direction,” “we invite you to line up in the center of the ring,” and “riders please retire to the rail.” The then says something like, “The winner of the Fair hunt Seat Pleasure Challenge is. . .” Once the ribbons are affixed to a halter or a boot, the riders file out of the ring wondering what the judge saw, or did not see. The winner of the class is given the opportunity to ride a half circle in the ring as the announcer says something like, “Presenting your winner of the “Fair Hunt Seat Pleasure Challenge,” and there are smiles and clapping and so on. Then the whole routine starts again. Now repeat for three days. But the folks at the Cheshire Fair are old hands at this and the weekend is well organized. We’ve been coming to the Fair with Debbie for a few years now, and so many of the people are familiar if not acquaintances. The Cheshire Horse Series is a show that you pay by the class and hence there are winnings if you are in the top three or four riders. 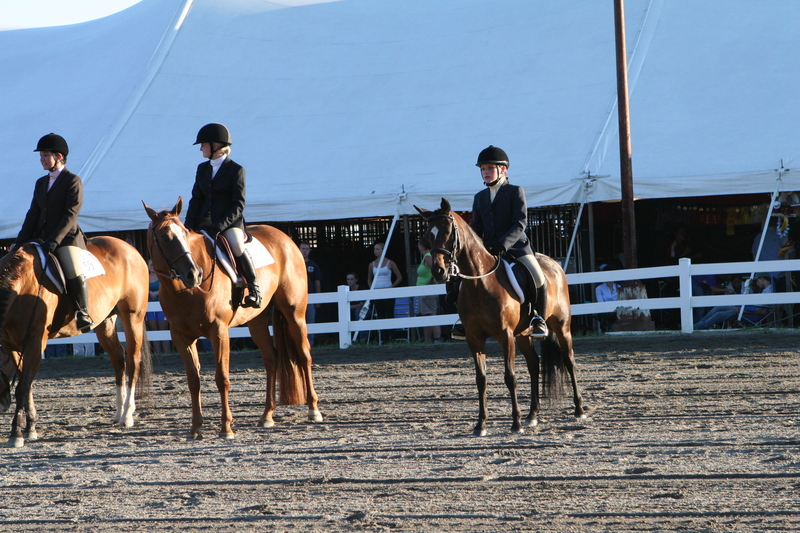 Ellinore, and her pony Reme, do quite well in a competitive field. 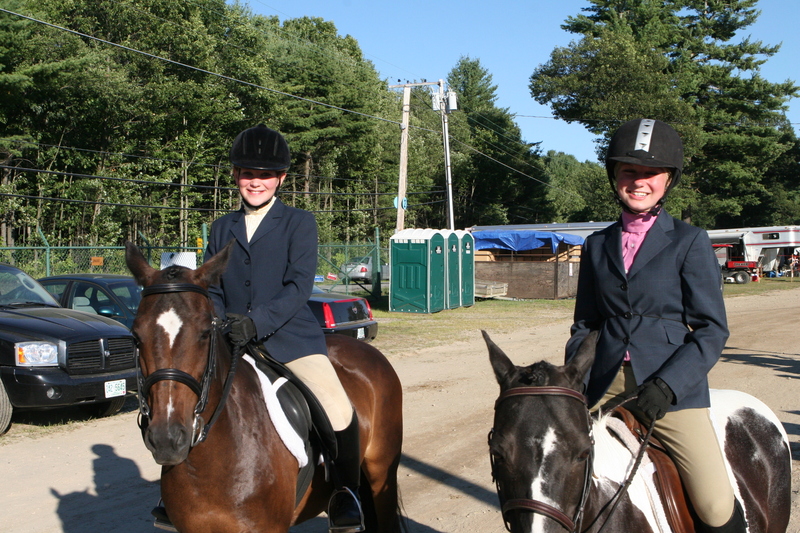 She places 3rd in her first class (“Open Pony in Hand”), 4th in “Pet Type Pony Under Saddle,” 5th in “Novice Rider Exhibitor Class, and in the last class on Sunday afternoon Ellinore and Reme take a blue ribbon in the “Pet Type Pony Under Saddle Championship” and walk away with a check for 40.00. We spent four hours at the Fair on Friday. (Friday night, Ellinore and her friend Claire join the older girls, Candice and Delilah, for a couple of hours walking around the rides and shows. When they arrive, I hear later, Delilah exclaimed, “I’m going to look for some hot guys”; to which Claire responded, “What will she do when she finds them?”) Saturday we arrived at the grounds at 7AM and we drove away at 11 PM. And on Sunday we were there at 7 again and stayed until 3.